The machine’s colorful case, which later inspired the iMac and the iBook, launched a new era in Apple design—though few realized it at the time. In fact, few people could actually buy the rugged machine when it launched in March 1997, as Apple offered it for sale only through education channels. Those are all features that would be replicated a decade later in the highly publicized One Laptop Per Child initiative that produced the rugged, portable XO-1 laptop. For example, in 1997, the Largo, Florida police department announced plans to outfit 20 of its patrol cars with eMate 300s for wireless arrest reporting from the field. A news report from that time also mentions that the department was waiting for Apple to produce a less-colorful “business version” of the eMate (which never happened). And according to one Newton fan page, Australia was planning to replace all of its government PCs with eMates, but Apple pulled the plug on the entire Newton line before that could happen. At the time of the eMate’s release, all of Apple’s desktop computers sported platinum gray cases, and its laptops came cloaked in charcoal gray. 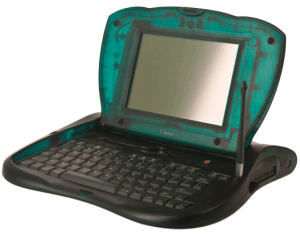 In the midst of that conservative color palette, Apple’s Newton division brought forth a translucent dark emerald green computer with playful curves, bulbous corners, and a prominent carrying handle. Apple’s pre-Steve Jobs experiments with translucent plastics, especially in the eMate 300, proved to be very important to Apple’s fate. Without the eMate, there would have been no iMac—at least not what we recognize as the iconic early translucent models today. Ultimately, Steve Jobs knew that Apple could only survive in that troubled time if it focused on its core business (the Macintosh), so the entire Newton line met its end in early 1998, much to the chagrin of Newton fans everywhere. The eMate died with it, but its legacy lives on. Its innovative visual design helped catalyze a new era of success for Apple, and its role as a low-cost learning machine for kids has now been fulfilled very well by the iPad.